The scanner library accomplishes the tasks of scanner parametrization and data acquisition. 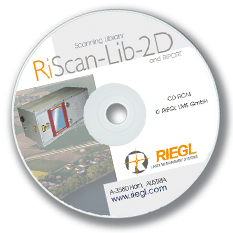 The whole range of RIEGL Q-series scanners can be accessed by a single uniform interface and multiple scanners may be controlled from a single PC. Multithreaded architecture assures smooth data acquisition while the user program might be engaged in advanced calculations or online data display. The library is usable for online and offline data decoding. The native or raw binary data as received from the scanner hardware is presented to the application software in its native data format, i.e. floating point numbers. The library also performs any desirable corrections to the data on the fly and presents it to the user as 2-D points in a cartesian coordinate system. The library comes with comprehensive documentation and sample code in C++/Pascal.